NCAAHPERD remembers the passing of members, friends, colleagues, and others within the profession during the past year. Dr. William L. Russell (April 13, 1935 – August 10, 1913) professor of physical education and chair of the department of physical education and athletics at Catawba College, died Saturday, August 10, 2013. Dr. Russell's funeral service was held in the Omwake-Dearborn Chapel on Catawba's campus, followed by interment at Bethesda Church and Cemetery in Aberdeen, N.C.
Dr. Russell graduated from Aberdeen High School in 1954 and earned the Bachelor of Science in Health, Physical Education and Social Studies from Catawba College in 1957. He received the MEd from UNC Chapel Hill in 1958 and the EdD from UNC-Greensboro in 1978. In 1958, he became a teacher and coach at Aberdeen High School in Moore County. One year later, at the age of 23, Bill's leadership abilities were recognized and he was selected to serve as principal of Hoffman Union School. Bill was principal at Vass-Lakeview Elementary School in Moore County, from 1964 to 1967. He taught health and physical education at UNC-Greensboro and was Supervisor for Student Teachers from 1967-1974. 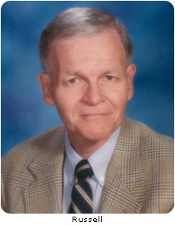 From 1974 -1991, Bill served as Coordinator of Health, Physical Education, and Athletics for the Winston-Salem/Forsyth School System, while also serving as adjunct professor at Gardner-Webb College. From 1991 to the present he was Department Chairman of the Physical Education and Recreation at Catawba College. Dr. Russell served as president of NCAAHPERD in 1980 and was honored on numerous occasions for his leadership. He was also the recipient of the Shepherd Alumni Award from UNC – Greensboro, The Trustee Award for Outstanding Contribution to Catawba College in 2013, and had an Endowed Scholarship awarded at Catawba College in his honor. You can read more about Dr. Russell and the sentiments of those that held him in high regard here.